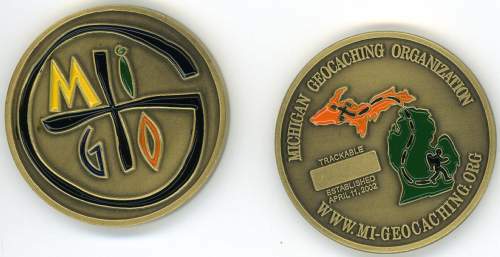 Starting this thread to admire the many coins and signature items available through geocaching. My wife is unimpressed with my private collection of trinkets. Many duplicates exist in this photo. This could also be a place to initiate coin trades. If you have a coin that you see I don't...I'd be interested. are you planning on keeping that jeep? WA coins around the outside kinda look the same. This is my serious face. Hey GEM's, is that a Bull Moose and Chewie button? Pretty sweet, ha? I've got a Bull Moose and Chewie button, and I'm not lettin' it go, either. I never keep TB's except the M10B coins with his permission. However, this is an uncirculated Jeep that is waiting for a special place. Here is my small collection. 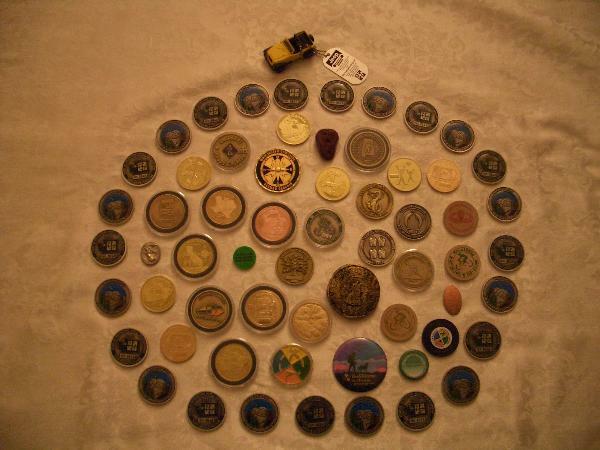 I already traded one of mine for a new PA geocoin from home sweet original home, didn't even know they had'em (they're sold out) until people started posting pix of their collections. I have another fellow who offered to trade a new unactivated PA coin for an unactivated WA coin if anybody else wants to cook up a trade. Let me know via private e-mail and I'll pass along the fellow in Pittsburgh's e-mail address. Woo hoo, we're famous, LOL -- I see an AGA coin in the middle! If anyone wants to trade an AGA coin for one I don't have, lemme know! I have a few more. 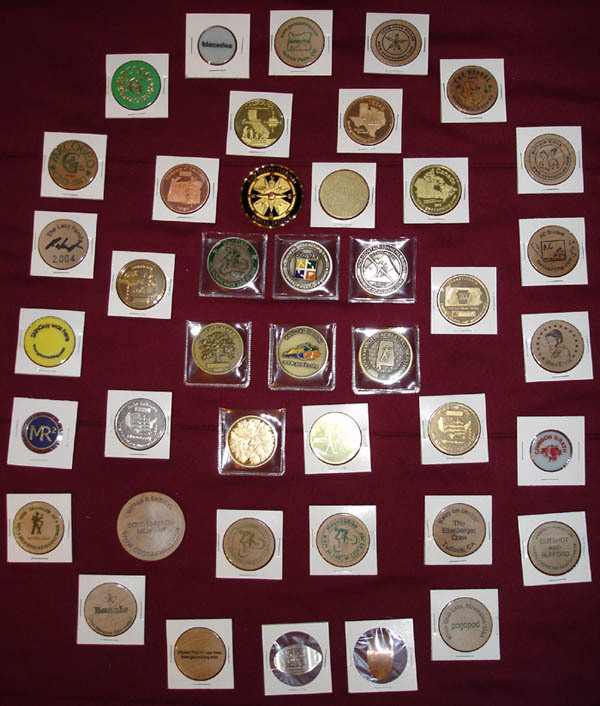 If you have something that's not here and would like to trade for a MiGO coin, let me know - I've got a bunch of them. It's hard to tell with the reflection, but do any of those collections contain all the M10B coins? I just might have to break out my camera. Now that I took a closer look I think GEM's does have them all. I've coveted a few coins that I can't seem to get... Greenman, 2Dolphins, and a few others I can't think of right now!! Would you consider selling two MiGO coins? Ok I'm stuck at home with no car (almost two weeks now) I must keep myself busy so i'm gonna play too. Now I want my Michigan coin, derned ole mail! oh btw if you try to photo shop the M10B coin it won't work I allready fixed it! I've coveted a few coins that I can't seem to get... Greenguys, 2Dolphins, and a few others I can't think of right now!! Greenman one you buy off the 'net. I'm wanting Pepper's coin, but I'm hoping she'll trade with me when I get my personal coin done. Hopefully by the end of this year. OK, here are mine, no duplicates shown. I have a Canadian coin and several lovely new Washington State coins available to trade for a California, Texas or Michigan coin or most anything else you dont see here. Eventually I plan to have a personal coin minted also. 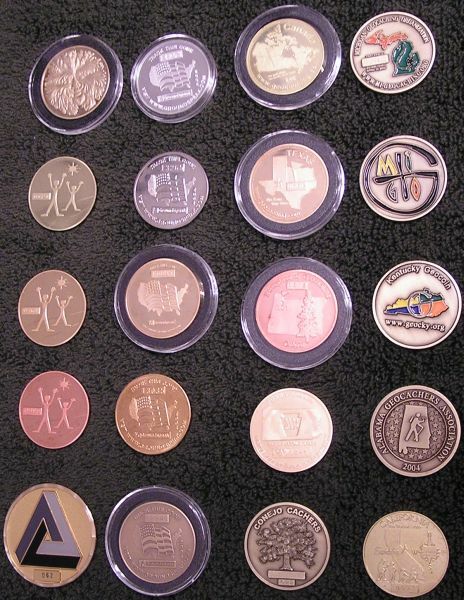 Personally, I think military coins are JUST as cool as the geocoins! I have two of them so far, and I'm always looking for more! I think they'd be serious geocacher-magnets. Go for it! I have 2 3-ring binder full of cards, buttons, items etc...but here are the coin pages. What's the one with the skull on it? That's a Goblindust geocoin. They are brand new - I got mine in a trade with him about a week ago. The reverse side is the same design as his button that you see just right of center near the bottom of my photo. Is that an MBC duck? I think this will work! Hey Moun10bike, is that a Mini-Ammo Box I spy in your picture, on the lefthand (slightly above the middle)? If so that's pretty cool, who's sig item is it? I have not seen one of those in person, but I believe that sig item belongs to UWDawg. I'm sure Moun10Bike will correct me if I am wrong. That was UWdawg's signature item. He also created several Travel Bugs using them. EDIT: WeightMan beat me to it! VERY cool! Hope he doesn't mind an email from me, LOL. Geez, Moun10bike, you have a LOT of the coins I've been coveting! How can I get ahold of one of the Washington coins like I see in your pic, with the soaring eagle? Anybody want to work up a trade? That's the same one I have in the mail to you Joefrog. Just be nice and don't tell him there's a typo on it like I did! I don't think he's forgiven me! D'oh! I was looking for the hiker, and didn't notice. LOL -- s'okay though, looks like I have another on the way from another trade! Thanks for the info on the sig item. Got my Washington geocoins in the mail today, and now I'm pondering having my own coin minted. Course I don't have a ton of money right now, possibly after tax returns. 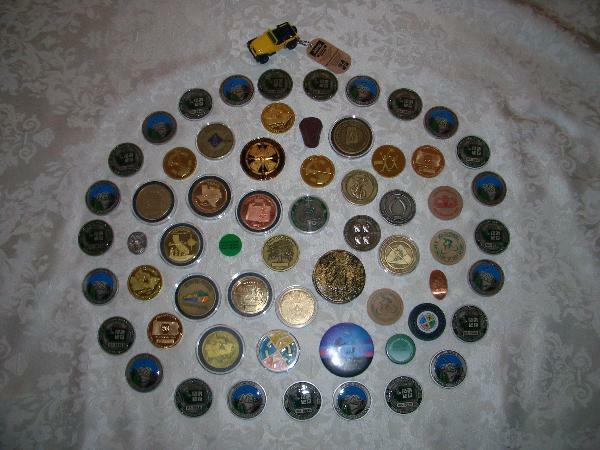 Any experienced cachers that have had coins made know of the cheapest route? I heard somewhere you could have a run of only 100 done, but at 4-5 dollars a coin that'd still be a hefty sum, and there might not be much better of a deal than that, least I'll know what I have to shoot for.